Lesson -17: What is difference between table and Div? Many people try to use table elements and its descendants for page layout, for two reasons. The first is historical: tables have been around longer than CSS. Second, tables offer a quick way to create a grid-based page layout. However, divs are more flexible for the same reason – they do not restrict the layout to tabular format. Instead, a div is like a “floating box” that can be positioned anywhere you want. Tables have many problems, including being more difficult for those with disabilities to read, as well as making it more difficult for search engines to find relevant information. CSS helps sites work across many different mediums such as PDAs, Web browsers, and mobile phones. div supports to position anywhere but table not support for this. For nested design we put lot of table but in Div we use simple structure. For tabular type data: It always easy to use table to display such data structure. This is the intended use of tables. 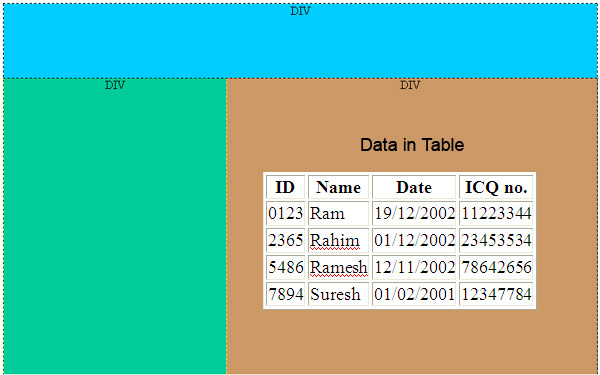 In Below image shows where DIV and tables is supposed to be use effectively.